Having relatives and ancestors who worked the San Joaquin Valley soil as farmers, Cynthia Luck Carr has it in her blood to love and respect those who work the land. Her commitment to facilitating holistic personal growth and sustainable communities has most recently manifested in her work toward the development of a resilient food system. As a bridge between producer and consumer, she is involved with many aspects of the system, such as facilitating consumer education courses and the development of a producer cooperative to make small acreage farming profitable. How did you get involved in the PEEP project? It started in 2008 when a growing awareness of our vulnerable Idaho food shed, turned into a need to act. I wanted my community to have access to local, safe, affordable, and sustainably raised food. In 2010 met Peter Schmid finding that we had similar beliefs, we brought people together to address just that. We defined the goal of increasing the profitability of sustainable small scale farms, determining that that our first project should address the missing infrastructure that producers need to stay in business. changing how people eat chicken would have a great impact on the system. Peter retired before the PEEP project was named but I couldn’t have come this far without his initial partnership. Why do we need a poultry processing facility in South Central Idaho? Anything that is expensive for the farmer ultimately either goes away or is translated to the end-eater. The infrastructure “beyond the farm gate” necessary for sustainable farmers to stay in business is missing, sub-par, far away, or both – raising the expense, reducing efficiency and therefore, causing farmers to either lose money or leave the business. Most people eat chicken and the national chicken industry is deplorable. Developing a sustainable Local poultry industry addresses all areas of cost – environmental, social, and financial – in our South-central Idaho area. What other ways have you been involved in food system reform? Besides spending my food dollar intentionally, I sit on committees such as the Blaine County Food Council, Blaine County School District Wellness Committee, and Blaine County Community Food Task Force. I developed the Wood River Sustainability Center for 10 months, before it changed hands, facilitating gardening classes and supporting and promoting local farmers. And now I help my local farmer friends connect with my local eater friends – occasionally delivering local food to vendors, and spreading the word about true cost accounting of our food habits. Oh man… I love a scratch-made, thoughtfully sourced, in-season meal shared with friends! The people who know how to fill their pantries with food raised on the local land and can feed their families for the winter… also Idaho sustainable Farmers! – those who take the risk to make things grow here. The term “organic” is a loose but important one. I don’t operate close enough to the definers of that term so I don’t use it exclusively to determine best value. When in doubt, it at least offers a definer. As with most things, one must dig deeper to understand clearly. 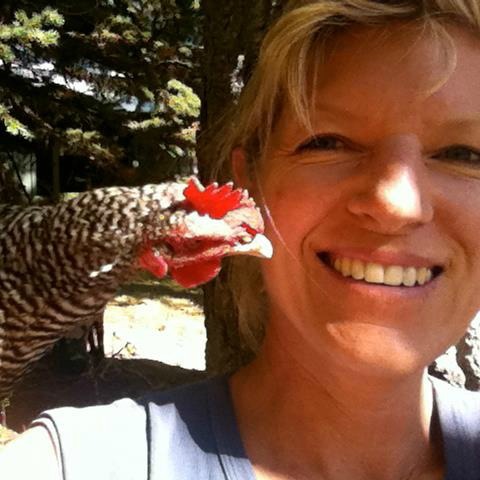 I’d rather eat eggs from Kathy Noble’s pastured hens than from a corporate “organic” egg company out of California where the hens have 2 square feet per bird. I’d rather eat a hamburger from a cow raised with Dan VanDerMulen’s designed care than organic beef from four countries sold at Costco. The mission of Idaho Farm and Food Guild is to support diversified southern Idaho farms. For me personally, I have met my goal of access to healthy, local, sustainably raised animal protein and fat. I would like to see the awareness grow in our community of eaters so that the food-providers (restaurants, cafeterias, grocers) source with the same standard – healthy, local, sustainably raised animal protein and fat. Because this is a growth process, meaning change in several areas needs to happen simultaneously, it is important to be diligent, and keep the end in mind. Eaters can ask for food prepared with non-toxic oils at restaurants and use their dollar as their vote for local clean food. Farmers can perfect their process to know true cost. Chefs can educate customers with true information about what they are eating. Bridge organizations, like LFA, Grange and IORC, can educate and connect. We all have impact. For us all to adopt the Hippocratic oath: First do no harm. Take the text and apply it to our eater system. It can apply to practices in all sectors of the system: farming and production, processing, distribution, and value-adding businesses. This also must include employer best-practices and “good governance.” Overwhelming? I start with managing my own hypocrisies and blind spots. First thought: transparency and accuracy on all menus with knowledgeable kitchen and front-of-house restaurant staff. The list gets long from there.